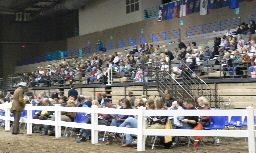 A big crowd gathered early Friday morning in Hale Arena at the American Royal complex for the UPHA Classics Incentive Yearling Sale. Before the sale started, everyone enjoyed a buffet breakfast graciously sponsored by Sarah and Landon Rowland. What sets this sale apart, besides the outstanding quality of consigned yearlings, is that all horses sold through the sale are eligible for extra incentive money when they show as three-year-olds at the UPHA Classics Finals. In fact, it was announced that five of the entries shown on Thursday night in the UPHA Classics Championships were eligible for a share of the incentives fund, having sold as yearlings in the 2003 sale. Three of those five horses shared $21,000, earning $7,000 apiece over and above the regular Classics payout. The DeLovely entry of General Spirit won $7,000 in the Fine Harness final with a 7th place finish. Coco Royale, owned by Bonnie Lee and shown by Tre Lee, earned an extra $7,000 with a 2nd place finish in the Three-Gaited final. Roseridge Posted Note took the $7,000 incentive with a 4th place finish in the Five-Gaited final for owner/rider Martin Cockriel. Like the Grand National program, a horse doesn’t have to win its class in order to earn the extra dollars. Thirty-eight yearlings were consigned with thirty-five going through the sale. After starting a little slow, like many sales, the crowd woke up when lot #8 came in. 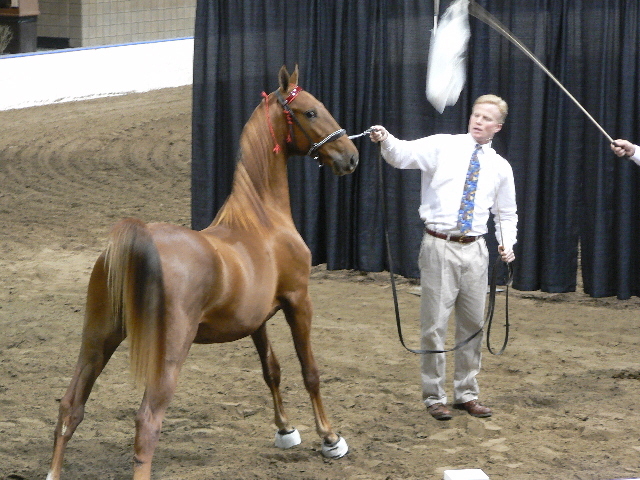 Bids quickly rose for My Ultimatum, a gorgeous chestnut gelding by CH Will Shriver son Ultimatum and out a good CH Caramac daughter. 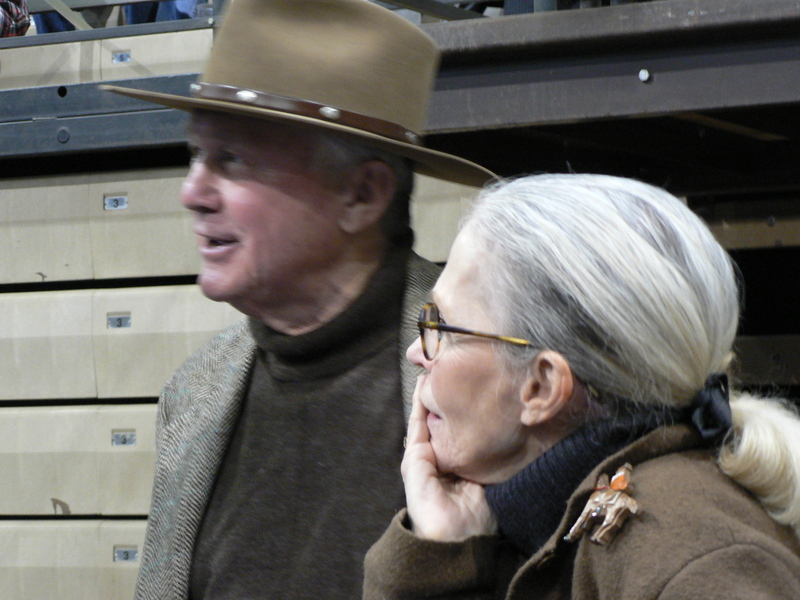 He was the sale topper for John T. and Nancy Trent Jones with Lynn Via of Fox Grape Farm making the purchase for $110,000. 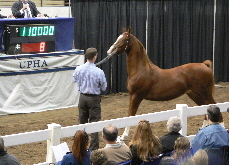 A second colt consigned by the Joneses brought the third highest price, $42,000. Our Excalibur is by Our Charm and out of a CH King of Highpoint daughter. He stays in Missouri with new owner Hollett Farm and Stables. Harry Hartsock "snuck in" with a Star Material colt, Walterway’s Believe In Me, to keep the Joneses from having the top two consignments. 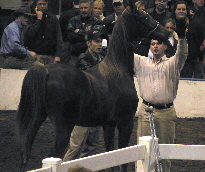 Bringing $43,000, this big-moving, handsome colt is a full brother to 2005 Ladies Five-Gaited WC Walterway’s Remember Me. In the 38th spot and final spot, he ended the sale on a high note. Walterway’s Believe In Me goes home to Kentucky with new owner John Conatser.